Nearest weather station, with distance and direction from RNA: The nearest weather station is at Centreville. The length of the record is 59 years. Annual precipitation (type, seasonal distribution): The mean annual precipitation is 55 inches. Maximum and minimum temperatures: The mean annual temperature is 64°F. Elevation: 300 – 500 ft.
Geology and Soils: The RNA is in the Clayhills Region of the Hilly Coastal Plain Province. Parent materials are bedded sands, clays and gravels of the Tuscaloosa Formation of the upper Cretaceous. Soils are usually of theBoswell, Luverne and related series. Aquatic Features: The entire RNA is dissected by steep drainageways that are usually dry, leading west to southwest from the main north – south ridge to Mayfield Creek. The area lies in the South Fork Sandy Creek watershed. 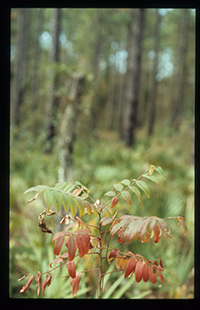 Plant Communities: In addition to longleaf pine (Pinus palustris), hardwoods include blackjack oak (Quercus marilandica), post oak (Q. stellata), southern red oak (Q. falcata) and mockernut hickory (Carya tomentosa). In the coves and drainages a variety of tree species occur: post oak, white oak (Q. alba), mockernut hickory, southern red oak, and swamp chestnut oak (Q. prinus). At Risk Species: Two active nests of the Red-cockaded woodpecker (Picoides borealis) were noted on the site. Rudbeckia mollis is a species of special concern. Common Herbaceous Species: cane (Arundinaria sp.) is common in the drainage understory. Beckett, S.W. 1980. An ecological study of the Reed Brake Research Natural Area, Alabama. Ms. Thesis, Auburn University, Auburn, AL. 131 pp. Beckett, S. and Golden 1982. Forest vegetation and vascular flora of Reed Brake Research Natural Area, Alabama. Castanea 47(4): 368-392.